Researchers working with NASA's Mercury Surface, Space Environment, Geochemistry, and Ranging (MESSENGER) spacecraft report the frequent detections of Kelvin-Helmholtz (KH) waves at the edge of the innermost planet's magnetosphere. In six different sets of magnetic field measurements made by the orbiter as it passed through Mercury's magnetopause, the boundary that separates the planet's magnetosphere from the solar wind plasma in the magnetosheath, Sundberg et al. detect the magnetic field oscillations characteristic of fully developed KH waves. Kelvin-Helmholtz waves form when fluids of different speeds travel alongside each other-in this case, the magnetosphere and magnetosheath plasmas-and promote mixing of the plasmas on larger spatial scales, and shorter time scales, than diffusive transport. The observations, which span the first 88 days of MESSENGER's time in orbit, bring Mercury alongside Earth, Saturn, and Venus as planets for which such Kelvin-Helmholtz waves are of importance. 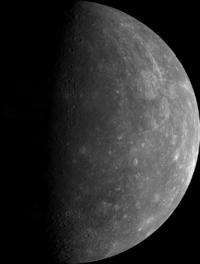 The waves seen at Mercury's magnetopause, however, differ markedly from those at Earth's. The authors' KH wave observations were all made in the postnoon and duskside region of Mercury's magnetosphere, whereas at Earth, KH waves are seen farther toward the nightside on both flanks. Moreover, the measured waves had periods averaging 10-20 seconds, whereas the periods of their terrestrial counterparts are several minutes. Also, the amplitudes of the measured magnetic field oscillations were 2-3 times larger than those seen at Earth. Wave growth at the magnetopause is known to be an important mechanism for transporting material across the largely impermeable boundary, and the authors propose that these newly identified Kelvin-Helmholtz waves could be the source of plasma for Mercury's dayside boundary layer, discovered previously by the MESSENGER mission.